I have been waiting for this book since May when I pre-ordered it. It is just what I wanted and more. In May I also ordered “Heirloom Knitting” by Sharon Miller. 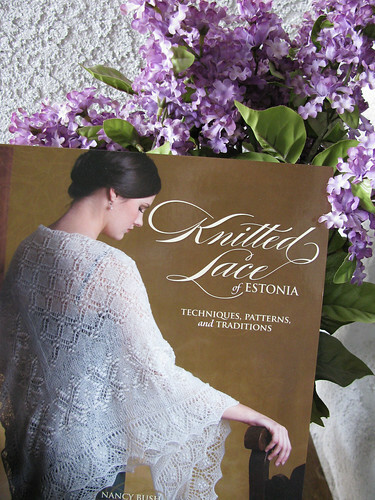 That book is is a classic, but I wanted the texture of Estonian Lace. There are so many designs in this Nancy Bush book and I am in awe of all her research. This book will be a classic too, if not more so. I am deciding whether to make the ‘Maikell’ or the ‘Queen Silvia’ Shawl first. Or maybe one of the smaller scarves, every design is so beautiful! This entry was posted on Thursday, October 30th, 2008 at 8:57 am and is filed under Knitting. Tagged: Book, Knitting, Lace. You can feed this entry. You can leave a response, or trackback from your own site.